UN chief Kofi Annan has called for rapid action to end violence in Sudan's troubled Darfur region, during a visit he described as "heart-wrenching". Thousands greeted the secretary general as he toured a refugee camp and a burnt-out town that survivors said had been bombed by the government. Mr Annan spoke to people affected by the ongoing humanitarian crisis and said the situation was unacceptable. At least 180,000 people have died and two million have fled their homes. Mr Annan visited the Kalma refugee camp, near the town of Nyala, which is home to 120,000 people. Tribal leaders told him that in recent months 56 people had been killed in the camp and 580 women had been sexually assaulted. They blamed the attacks on Arab pro-government militias and Sudanese police. 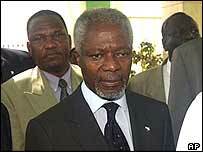 Afterwards Mr Annan said what he had heard had been "heart-wrenching". "Obviously everybody says it's better than it was last year, but this is not a situation that can be acceptable for long," he added. "What we need to do is to create an environment, a secure environment that will encourage the people to go back home." Those living at the camp are reliant on food relief and health services provided by the UN and other humanitarian agencies. Mr Annan also travelled to Labado - a town largely destroyed in fighting last year. Residents who had returned to their ruined homes called for greater protection. "Now we are back but still we don't have security and we feel unsafe," Murra Ahmed told Mr Annan after she described how five government planes had bombed Labado and driven her out, Reuters news agency reported. On Friday Mr Annan emphasised the need for peace in Darfur, during talks in the capital Khartoum with Sudanese Foreign Minister Mustafa Osman Ismail. Earlier this week donors promised an extra $300m (£165m) for peacekeeping in the region at a conference in the Ethiopian capital, Addis Ababa. 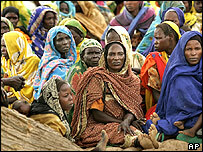 The African Union had requested $466m to enable it to triple its force in Darfur to about 7,900 troops. On Sunday, Mr Annan will visit southern Sudan, where a peace deal was reached earlier this year to end 21 years of civil war. He will hold talks with former rebel leader John Garang, who heads the Sudan People's Liberation Movement.